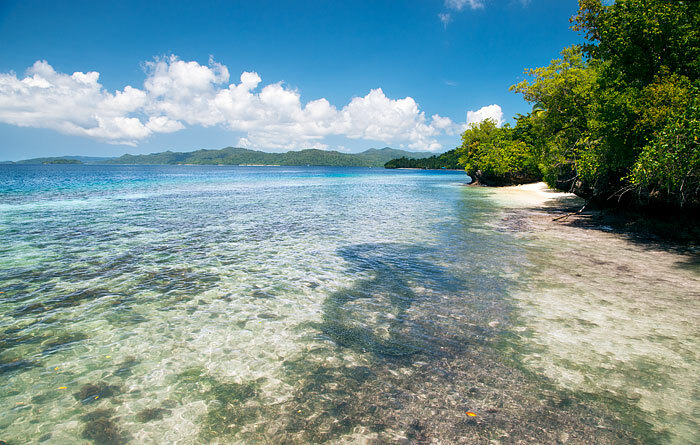 A coastline full of coral, freshwater springs and laughing children, Wilson’s and Red Birds of Paradise nearby and some of the best cooking in the islands. A single room bungalow (no ensuite bathroom/toilet) Sleeps max. 4 persons / room. Warimpurem Homestay is near Saporkren village, about a 20 minute car ride away from Waisai port. Four private bungalows are available. Two are located on the beachfront, the other two are on land close by. All bungalows have real double beds and extra mattresses can be provided if required. Bedding includes sheets, pillows, bolsters and mosquito nets. All rooms are equipped with power outlets, room light switches, a small desk with lockable drawers and a mirror. Bathtowels are provided. Each bungalow has a covered verandah with seating and a small table. Meals are served in a separate dining shelter and comments in Waripurem’s guest book show that Mama Engge’s cooking is one of the highlights of most guests’ stay. Guests will always find free drinking water, tea and coffee available in the dining shelter. There are also more power outlets there for charging devices. A voltage stabiliser is provided for sensitive equipment. In addition to a couple of hammocks provided in the dining shelter, there are a few beachside bench seats and tables for relaxation. All guests share a 3 roomed, tile-floored bathroom building. 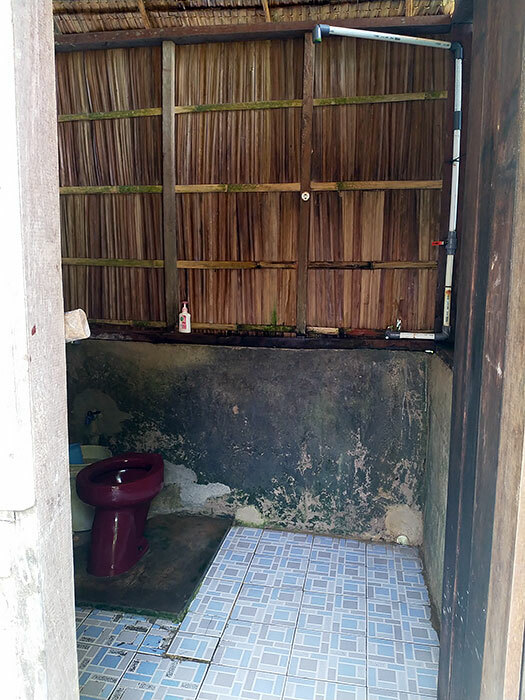 A western style toilet is provided in one room, a shower in another, and a traditional squat toilet and dip mandi is provided in the third. Warimpurem has a strong mobile phone signal which usually supports a 3G data connection and electricity is provided by generator from sunset until around 1.00am. The nearby village of Saporkren has some small shops selling basic supplies. Saporkren is a short boat ride or 30 minute walk away. Waisai can be reached by car in about 20 minutes if you need more than Saporkren can supply. AS everywhere in Raja Ampat, its best to take all your inorganic trash away with you when you leave so as not to contribute to the islands’ growing rubbish problem. English is spoken at Warimpurem Homestay. Please note: Coconut crabs are a protected species. Please don’t buy them. Warimpurem Homestay will refuse to cook any you might bring and will instead ask that you release them. Warimpurem is connected by sealed road to Waisai and transfers from the ferry harbour cost IDR 250,000 each way. Price is per journey and can be shared among the vehicle passengers (the cars used can easily accommodate four passengers and baggage). 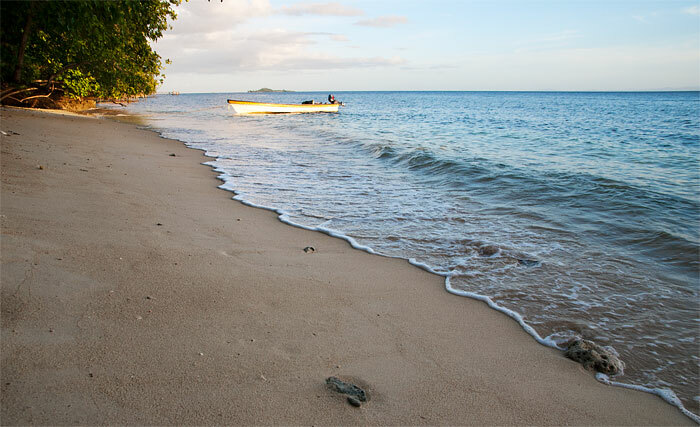 Warimpurem Homestay offers diving, snorkeling, Bird of Paradise tours and the opportunity to explore Saporkren village and the hidden bays and springs between there and the homestay. 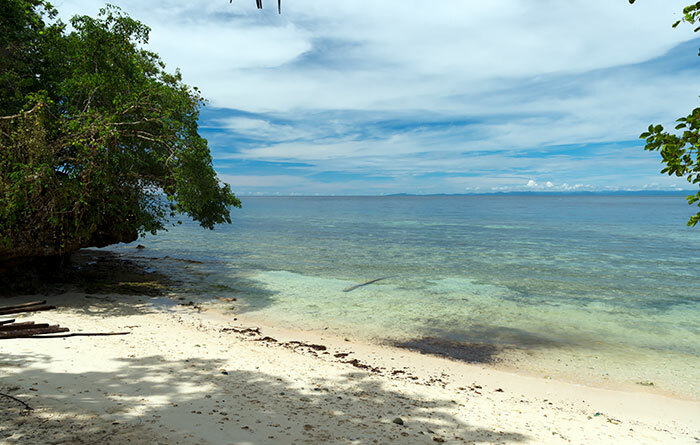 If you have your own snorkelling equipment there’s seagrass beds and a reef dropoff to explore at the homestay and some great snorkelling over colourful coral around the Kabui Bay jetty at the western end of Saporkren village. Marine life beneath the main jetty at Saporkren is also worth a look. Diving can be arranged in conjunction with nearby service providers. See this page for essential Raja Ampat diving safety information. Warimpurem’s Bird of Paradise tour guide can show you Raja Ampat’s famed Wilson’s Bird of Paradise as well as the more common Red Bird of Paradise. Bird of Paradise tours cost IDR 200,000 per person per site (IDR 400,000 per person if you want to see both species) and start early to be on site at dawn when the birds display. It’s about a ninety minute walk through the jungle to the Wilson’s site, departing before dawn at around 4.00am. There is also a good spot for observing cockatoos which is a much shorter hike, being about a 30 minute walk from Saporkren. Saporkren is a pretty village and well worth visiting, especially by walking along the beach at low tide. Just to the west of the homestay is the strong spring of cool, fresh water from which Warimpurem takes its name. 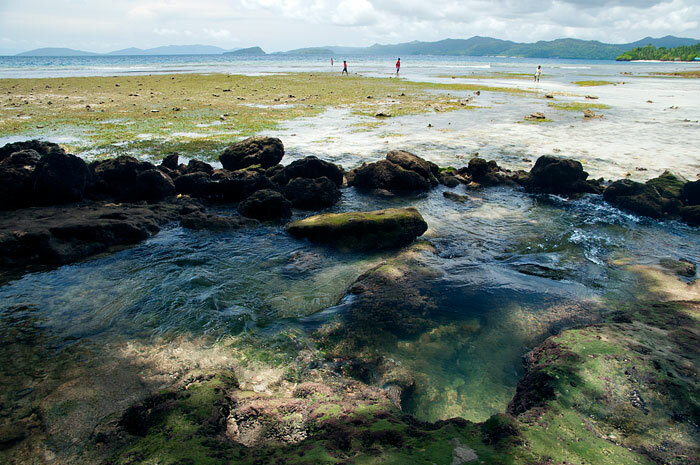 The Warimpurem spring and two others just like it are only visible at low tide and the walk to the village passes several white sandy coves and shady picnic places popular on the weekends. A raised boardwalk around a rocky bluff near Saporkren offers some great ocean and beach views. Watch for the pods of dolphins that regularly visit this stretch of coast. Saporkren can also be reached via the road that passes the front of the homestay and then via a jungle path that continues from where the road ends. Traffic on the road is very light and almost all vehicles are motorbikes except on weekends when Waisai locals visit the beachside picnic spots along the coast. I stayed for 3 wonderful days at Warimpurem, my bungalow was the best of all the homestays I stayed in with a real bed, clean bed sheets and pillow, no bugs, right in front of the ocean, being 6 feet tall, I never hit my head which happened frequently in other places. There were 2 chairs and a table on the veranda. The food is as good as all the other reviews say and Abraham is always there if you need anything, his English is good and he is fun to hang out with, loves to laugh. The Coral is good with lots of fish. It’s too bad I had to leave at the last minute or I would have stayed longer. Hello hello! We stayed here for only 1 night on January 29th, 2019. It’s a great option if you want to be close to Waisai to catch the early ferry. The family were very friendly and kind. The food we had was very tasty and plentiful. 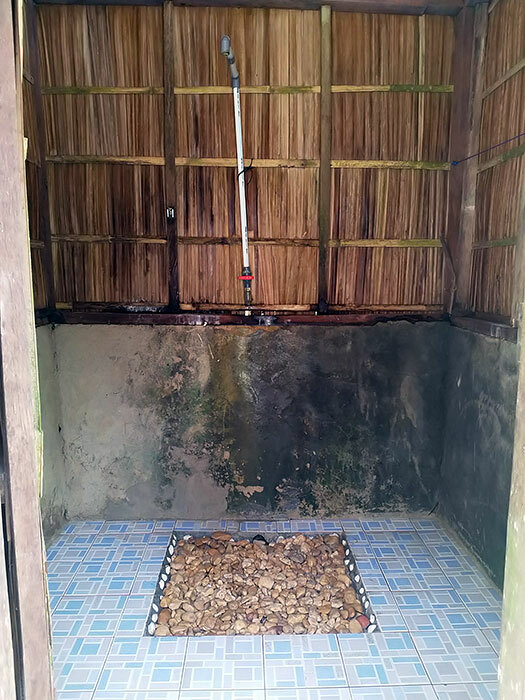 The facilities were all extremely clean. The only thing we felt that could have been better was the price. It’s 400,000 compared to the standard of 350,000 we paid in other places we stayed. I know it’s 50,000 but in our opinion it didn’t stand out enough to pay the extra 50,000. Thank you very much to the waripurem family and we will see you next time! Good health and happiness to you all! We stayed at Warimpurem guest house in January 2019 for 5 nights. We arrived at sunrise and were welcomed with breakfast soon after and a comfortable clean bungalow with a real bed and mosquito net. We also had a nice shaded verandah with comfortable chairs and a table. Inside the bungalow was a small cupboard for storing small things. Our cabin was absolute beach front with beautiful views across to Gam Island. The family were really friendly with Joseph speaking fluent English and being a really friendly , helpful , fun loving person. He was shy at first but took us to look for cuscus, birds of paradise, to Wasai to see the doctor and visit the bank, bought us things on request when visiting Wasai and spent time chatting and sharing jokes. A really lovely man. The food was gourmet standard. Fresh tuna grilled, fried, curried, cooked whole with delicious flavours, eggplant, beans, water spinach, tempeh with peanuts, noodles, fried rice, fresh fruit, freshly baked cakes, fried bananas in batter, coffee ,tea all delicious! We never had the same food twice and we always ate too much because it was so delicious, diverse and plentiful. The reef was good with lots of coral and fish. I even saw lobsters hiding under rocks. Dolphins went past everyday. There were large butterflies flying around the compound everyday, a regular visiting palm cockatoo and lots of other birds flying around nearby. There is a road behind the guesthouse that you can walk along to watch birds and butterflies easily. It is a quiet road with little traffic but it is useful if you want to visit Wasai. We went to see the BOP with Abraham. We saw the Wilson’s bird of paradise but missed the red bird of paradise. Other guests saw the latter the day before so we were just unlucky. There is a really lovely village nearby called Saporkren that you can visit by walking on a boardwalk around the coast. The people are welcoming and curious. I highly recommend this homestay. It was delightful and unforgettable. A very nice experience in this homestay, on a pretty little beach! The bungalows are clean and the 2 located on the beach offer a nice view! Mama Angelina prepares dishes that are disproportionately delicious and well supplied! Unquestionably unbeatable in all Raja Ampat! Fresh fish, vegetables, variety of dishes, surprises and little touches in the afternoon, everything is homemade, a real treat! Authentic little family, and welcoming (a hello to Emiliano, the baby, my namesake!)! If you are early do not miss the sunrise … and the dolphin colonies that swim off! You’ll have to have the opportunity to see the birds of paradise or couscous (choose your guide well), or to visit the village 10 minutes walk for a meeting with locals! Thanks a lot and see you! We only stayed in his homestay one night, but it was a great experience. The homestay was a very elaborate bungalow with a big comfortable bed and spacious room. Food was great too and sunsets are spectacular. Abraham was willing to chat and give us tips and helped us to arrange a taxi to the ferry. It’s a great place to stay on the way to Sorong or even longer, especially if you want to see Birds of Paradise. We visited Warimpurem Homestay in early Dec and stayed for 3 nights. We highly recommend staying here for the friendly and peaceful atmosphere, the beauty of the area, excellent birding opportunities along the quiet road…. and the absolutely outstanding cooking! Thank you to everyone who made us feel so welcome. We would also like to thank Yan, who is a driver in partnership with this homestay, for going out of his way to help us communicate at a pharmacy, mail a package, and on top of that give us an impromptu Waisai tour! We loved the Warimpurem Homestay. Our room was very comfortable. The food was excellent and plentiful and we appreciated the extra snacks mid-afternoon. Abraham and his family were friendly and helpful and the kids were lovely- they came running over to show us when they’d spotted a cuscus in the tree up the road! The Homestay was also a great base from which to do the Birds of Paradise tour, which we enjoyed and on which we saw both the red birds of paradise and the wilsons. Overall, highly recommended! Hi and thanks to everyone for helping me with an information! I will come to RA in January and will complete my AOWD with Raja Ampat Dive Resort, but I prefer to stay in a Homestay. So I am searching for one where I can walk to the Resort for the Course. Does anyone know if its possible to walk there from Warimpurem? And if it is a beach walk: Is it depending on tide or the whole day? You can walk the road from any of the homestays near Waisai to that resort. You may even be able to organise a ride on a motorbike. 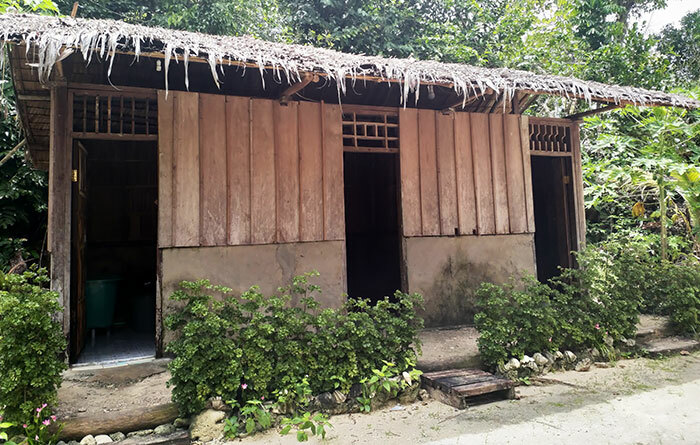 Between 17 and 21 Nov 2018 my husband and I stayed at Warimpurem Homestay located on Waigeo island, between Waisai and Saporkren village. The host family was very lovely and helpful. The bungalows are basic but great (we stayed at the beach bungalow). The food prepared and served by the host family was absolutely delicious! Abraham – one of the sons/cousins of the homestay’s owner who also lives there – is a great local bird guide! He took us and another tourist couple for a bird-watching tour into the nearby forest to see two different species of Birds of Paradise – Red BOP and Wilson’s BOP. The trip was great and very successful – apart from both BOPs we have also seen other interesting bird species. I can thoroughly recommend staying at the Warimpurem Homestay and arranging birding tours with Abraham from the homestay. One thing to NOTE for all tourists – please avoid bringing single use plastics and packaged products as it appears that there is no official waste management system or infrastructure in the area and one way or another, your plastic/metal rubbish might end up on the beaches or in the ocean. If you can, I suggest you don’t bring such items but if you really must, try to take your inorganic rubbish away and dispose of it in a bigger city / back home. We had a wonderful time at Warimpurem Homestay. It is very simple but all you need. Food is great and we never had the same thing twice. Everything is well organised. The family is friendly, so are the cats. Be prepared for a really snuggly one that won’t leave your lap. It was all clean, beautiful beach and coral just outside our hut. The family helped us organise a few trips and even let us rent their personal scooter to pick up our lost luggage. I stayed 3 nights here – what a great place to be! The house reef is simply fantastic – I spent many hours snorkelling . The food is also fantastic – incredibly delicious and variable! I did a snorkel tour and friends of mine also did a hike – Abraham is a very friendly and knowledgeable guide. The bungalow and bathroom facilities were great, as well. Very clean and comfortable. We loved warimpurem and angelique and her family who took good care of us. A special thank you to angelique for agreeing to take me to church … which i know is a very private thing. The snorkelling from the beach was lovely. The reason for not 5 stars is related to getting around and lack of open sharing about options and the variability of meals if angelique was not around. The village is so worth a visit and we thank them for their hospitality. My family of four thoroughly enjoyed the peaceful beauty and kind hosts at Warimpuren Homestay. As advertised, the food was fabulous! Christine and Engelline know how to cook for vegetarians, using yummy spices and sauces. Yay! Laura, who lives there and is fluent in English, was helpful in making excursion arrangements. Some nights got quite warm and there’s no electricity during the night for a fan, but that’s the case in most homestays on R4. Being right on the beach helped. The house reef is excellent, and there are so many fabulous reefs to snorkel and dive just a short boat ride away. We paid just 1.4 million RP for a boat for full day of snorkeling. The family at Warimpuren is lovely, respecting privacy while also being thoughtful and available. The dogs and cats are well cared for and friendly. We highly recommend it! Great place! Food was delicious! Family was amazing! Abraham was especially helpful and took me on some great hikes in the area to see cool wildlife. Can’t wait to return! Stayed there 2 nights and we had an amazing time at Warimpurem homestay. Our pick up was accurate at waisai harbour and our hosts were very nice. The food was far the best in Raja Ampat. Their snorkeling and bird watching tours were enjoyable and well organised as well. Thank you and we can only recommend staying at this homestay. Very, very happy for spending two nights there! Amazing, quiet place between two small cliffs at the beach. Very comfortable beds, all that you need inside, outstanding food (better than in two other homestays we’ve been in). 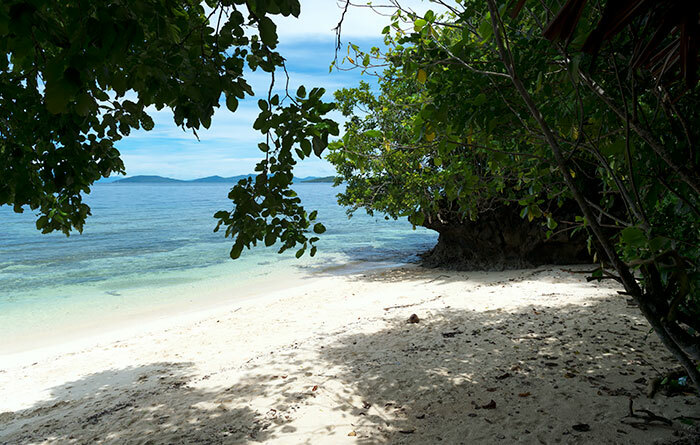 Just 15minutes walk from Saporkren village forgottem by time… Coral reefs – amazing as on Kri, 20 meters from bungalows! Diving possibility nearby but a bit expensive. Our rate: Just go and feel it! We loved our short time here and would highly recommend! Transportation – Once off the ferry, the really nice guys at the tourist information centre (where you buy your permits) were expecting us and showed us to a car… Waripurem was approx 20 mins away. Also, arranging a boat to our next homesty on Kri was very easy and for an extra 100Rp, our driver stopped at Firwen Wall for an hour so we could snorkel. Food – was excellent… incredible whole fresh fish, fresh fruit and a great selection of veggies – it was 100% the best food we had during our stay in Raja Ampat! On a general note (not just relevant for here) – if you’re a big coffee drinker, bring your own as its only the local dusty stuff that is provided at home stays and no milk / creamer. And if you’re in to spicy, we were very glad e brought our own chilli sauce! Location – was great, right on the beach and easy taxi ride in to town which Abrahim can arrange for you! The snorkelling off the beach is lovely and your right on the edge of the forest so have a good chance at spotting wildlife. We saw two Cous Cous, fireflies and tonnes of beautiful birds. Staff – were outstanding… Abrahim speaks amazing English and is super helpful and chatty. He and his friend guided us on the Bird Of Paradise tour and couldn’t have been nicer. Cleanliness – our rooms and communal areas were kept very clean and tidy. Wife and I stayed at warimpurem for a week in feb 18 and loved it! The location, the housereef, the tours and the food are all phenomenal. Abraham was an amazing guide with a really good eye for spotting wildlife and the whole homestay family is so sweet. Highly recommended! We only stayed at Warimpurem for one night before heading to Waisai to catch the ferry, but wish it could have been more. We went on the birdwatching trip with Abraham to see both Red and Wilson’s Birds of Paradise, which was fantastic (400,000/person). We saw mantas and dolphins from the shore and enjoyed snorkeling the house reef. The food was the best we experienced in Raja Ampat, with lots of diversity. The dining room was lovely and had a sink for handwashing as well as charging stations. There’s also a real shower. Warimpurem was one of two out of our five homestays that provided afternoon snacks. It also seems like the cleanest homestay we stayed in. The family was absolutely lovely, especially Mama. Laura—who works for Stay Raja Ampat—also lives at Warimpurem and takes her meals with guests. There isn’t a boat on hand, which might make it difficult to organize snorkeling trips if desired, but we didn’t enquire. We also stayed at Corepen (5/5), Beser Bay (5/5), Yenmakrak (3/5), and Mangkur Kodon (5/5) homestays if you want to check out our reviews for comparison. We stayed at Warimpurem for 3 short, blissful days. As soon as we arrived Arnold pointed out a Hornbill above the homestay. The next morning we did the 5am, tough one hour hike with Abraham to see the Birds of Paradise. We were rewarded with seeing the Red Birds of Paradise. The home-cooked food and snacks were delicious and plentiful. Snorkeling was top-notch with healthy corals and lots of reef dwelling fish, all just a short swim from the white sandy beach right in front of our bungalow. We even did some freediving at the dropoff. All in all an unforgettable experience. We stayed at Warimpurem Homestay for 2 nights, mainly to go and see the Red and Wilsons Birds of Paradise (BOP). We stayed in the waterfront chalet, on stilts, overlooking the small beach. The room is very basic, a small double mattress on the floor with a mosquito net that tucks under the mattress. I am 5’10” tall (1.75mr) and I was too long for the bed, managing to kick the net out during the night. There was a small dresser with a cupboard, which should be used to store all liquids, gels etc that will get chewed by the rats who are very inquisitive and test everything that is left out and accessible. There is also a line and a few pegs to hang clothing and small bags from, but we lived from our suitcases for two nights. There is a small veranda to sit on with two chairs supplied, but we preferred to sit at the tables or lounge in the hammocks in the communal dining area when relaxing. The food is served at 0800, 1200 and 1900 and is what the family are eating in their home. Hot drinks are available all day and a free water supply to fill your bottles from. Breakfast is cake and fruit. Rice is the mainstay of lunch and dinner along with a variety of vegetable dishes and usually fish for lunch and chicken for the evening meal cooked in a delicious Papuan sauce/coating and well spiced and full of flavour. Most probably the best food we ate during our stay in Raja Ampat. If you want to do the BOP trek speak to Abraham and he will take you up into the Rain Forest, setting off at 5am, returning at about 9.30am for a late breakfast. Make sure you take a small snack, plenty of drinking water, insect repellent, camera and binoculars. Abraham points things of interest on the way up, but likes to move at a good pace in order to get to the first viewing point to see the Red BOP in the treetops. Then it’s on to the hide to see Wilsons BOP. We had two amazing experiences seeing a mating pair of Red BOP and watching the Wilsons BOP cleaning his stage and displaying in his arena. Warimpurem is a genuine homestay and you live along side the family going about their daily lives and the children playing and having fun. Try and interact with them all as they really appreciate having you stay with them and are always ready to try and help make your stay a wonderful experience. 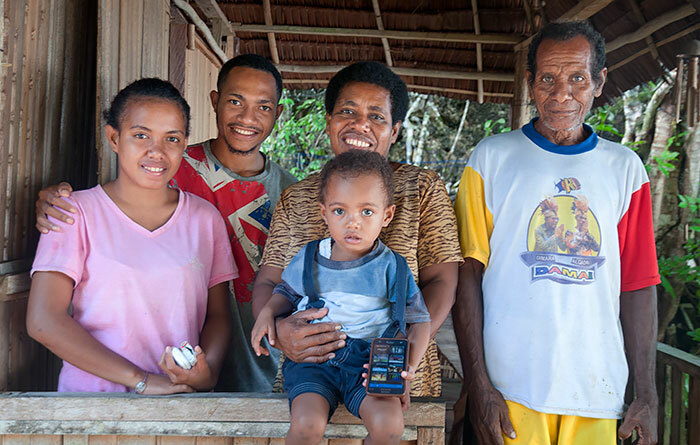 We were lucky enough to experience seeing the locals celebrating Christmas and New Year during our stay West Papua. In particular on New Years Day in the village of Saporkren we witnessed the local parade, the men beat handmade drums and the ladies played bamboo flutes and all the locals did their dance up and down the main street in two lines with the children in the middle all dressed in their Sunday best. Amazing place!!!! The best people to stay at!!! Locals, extremely helpful, nice, taking care of all you need while staying there! The accommodation is basic, but clean and all you need. During our stay we meet Laura who gave us a big help in planning our next steps in visiting Indonesia. The food is one of the MUST TRY!!! No matter were you stay you can go and talk to Kristen or Abraham (they speak english) and ask to come for lunch or dinner. Maman is the owner and the cook ! She always has very very good food (Best we tried in ID) freshly maid, using local ingredients! 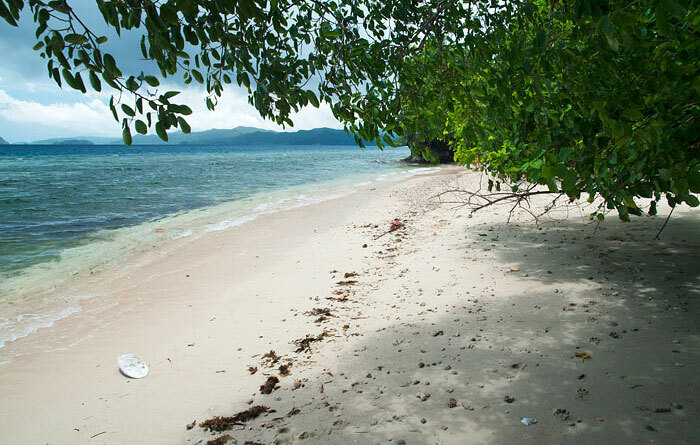 There is also a small clean, white sandy beach that is all yours during the stay (shared with other guests). You can just lay on the beach, stay in the hamac on the porch in front, go for a swim, snorkel or book a dive with the dive centers near by (usually they ofer also transportation from & to your place). We also took the bird watching tour with Abraham, that lives there and it was really nice! We went early in the morning and we saw Wilson Bird of Paradise really close. The walk in the jungle with a local guide is really worth it! bonjour?Nous avons passé un très bon séjour dans cette homestay !Très propre et confortable ,très bonne nourriture. Idéale à l’arrivé ou au départ du ferry.Pour le snorkeling c’est pas le top après les autres îles ,mais par contre pour l’observation des oiseaux c’est le meilleur endroit. We stayed at Warimpurem with the goal of seeing birds of paradise, and on that count it delivered! We had a great birdwatching tour with Abraham, a knowledgeable guide and quite a character. We saw the Red Bird of Paradise and Wilson’s Bird of Paradise. Abraham’s skills are impressive. As we got close to the area where the Wilson’s displays, Abraham could tell by the sound of its calls that it was in its lek and we couldn’t approach without scaring it away. We waited until it was safe to sneak up on the lek and were treated to the sight of the bird tidying its display area. Not all guides demonstrate this level of care and attention! Warimpurem is in a prime location for other birds. We walked the road 10-15 minutes in the direction of Waisai, where there is a banana plantation amidst the jungle. In the mornings and late afternoons, this area is alive with bird calls and hornbills, parrots, and cockatoos swooping between the trees. It felt like the Lost World, paved road notwithstanding, and was a nice complement to the water-based activities in Raja Ampat. Speaking of the ocean, Warimpurem didn’t quite measure up to Gam, Kri, and Arborek as a snorkel destination. When we ventured in, the visibility was terrible and the seagrass stretched out a long way from shore before the coral started. The reef felt a bit more exposed to the open sea than in other places, so we didn’t snorkel much. The birds and jungle made up for the lack of spectacular snorkeling. As everyone else has commented, the food is excellent and abundant. We appreciated the late afternoon snacks, it would be nice if all homestays provided this. 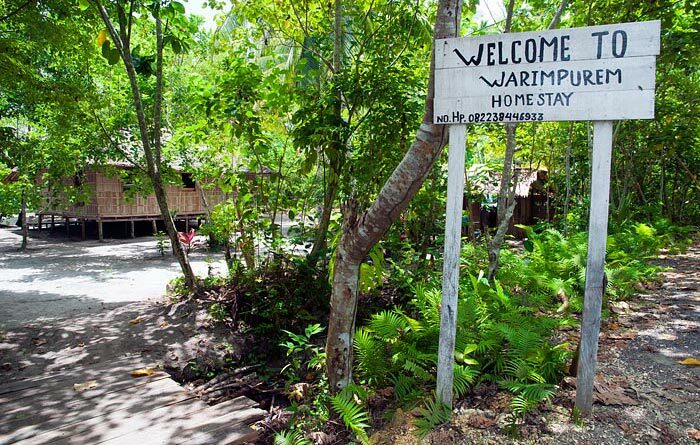 It was our first homestay when we arrived in Raja Ampat. The bungalows were very good and the place very clean but after my experience of having tried the food in other homestays I trully could say that the food is THE BEST in all Raja Ampat: the variety, the way they cook and serve the meals, the desert after the meals … a lot of details to be appreciated. However on the other hand they are not very helpfull in solving problems if you want to move to other islands. And also we wanted to pay in credit card because of a big sign they have but their machines didn’t work. It’s a perfect homestay just to see the birds and walk in the Saporkren village. Sorry about the EDC machine, we will solve that problem as soon as we can so it wont bother our guest. Absolutely fantastic food and loving family. It was a great start of our holidays in R4. We also really enjoyed the birding tour with the guide Milky; because of the rain Wilson BOP was not there but we saw the red BOP and many, many more birds and cous cous. presence of English speaking Laura and Fahmy was also very helpful and great source of information. Also dophpins/ birds of prey passing in front of the bungalows almost every day. Thank you for your stay, feedback and five stars here. And we wish you enjoy your holiday in Raja Ampat and back again in future. Simple but the cook is great (which is quite rare in the area) and the people nice and helpfull. The dive center besides (raja Ampat dive resort) unfortunately is much more expensive that anywhere else. If not we could have staid a long time here. Five star for this range of guesthouse. FYI for diving trip at Warimpurem, there are some options with dive centers nearby. 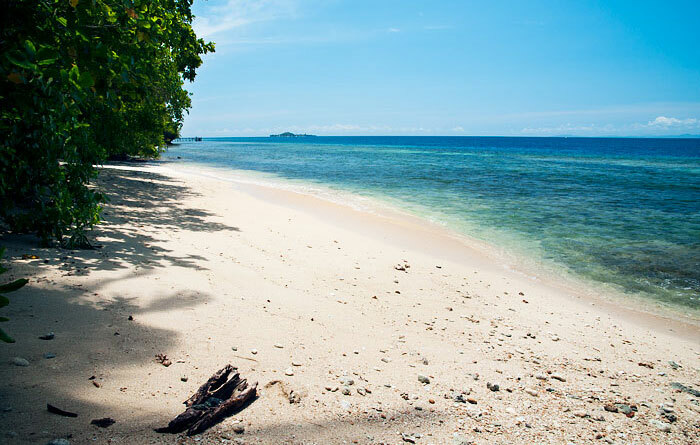 Could be arrange with Raja Ampat dive resort, Scuba Republic and Kordiris Homestay on eastern Gam. We stayed in the beachfront bungalow for 5 nights in june and really enjoyed it. The place is not too far from Waisai so you can get there for a reasonable price, the bungalows, although basic, were exceptionally clean, the mosquito nets looked rather new and our bedsheets were changed and the bungalows were cleaned during our stay, which helped made it even more comfortable. The bathroons are pretty clean too by the way. The reef right off the beach was amazing for snorkeling and a dive center was nearby. The owners – especially Mama Enggi – were very welcoming and along with that made some of the nicest food we had in all of indonesia. I guess I will have to come back one day. Thank you for your feedback here, we’re really appreciate it. -Fahmy speaks excellent English and really cares about his guests. He helped me to solve several problems, was totally reliable and competent. He also organises lEnglish lessons for children and was a great teaching partner. The children were keen to learn and remembered what we had done about one month later. You will enjoy the experience. Kri. But the other advantages make up for it. -The taxi from the port to the homestay is 200 000. If you have little luggage it is possible to take a motorbike, but the road is rough in parts and quite uncomfortable. Thank you for your feedback, the pleasure is ours to have you at Warimpurem Homestay. do you can arrange the Transfer from your Homestay to the Ferry? and how much is it? All homestays can do that Chris. The price is quoted above under the Transport/Getting there heading. Could you pick me up from Kordiris homestay? How much does it cost? How far are you to Kabui Bay and do you make excursions there? Warimpurem is right at the entrance to Kabui Bay and can organise boat trips there. Do you have ‘What’s App’? We were so happy we stayed at Warimpurem on our birding tour of West Papua. The food was easily the best we had on our holiday – and that includes fancied hotels on the mainland. Our hosts couldn’t do enough to make our stay as enjoyable as possible. The birding with local guide Bram was excellent and we were thrilled to see cuscuses and striped possums right in front of the homestay. Fahmy and other locals provided informed and stimulating conversation. I’m guessing I’ll be back…..
Hi Steve, thank you for your feedback and five stars here. I stayed in this homestay for one week and then again for one day. 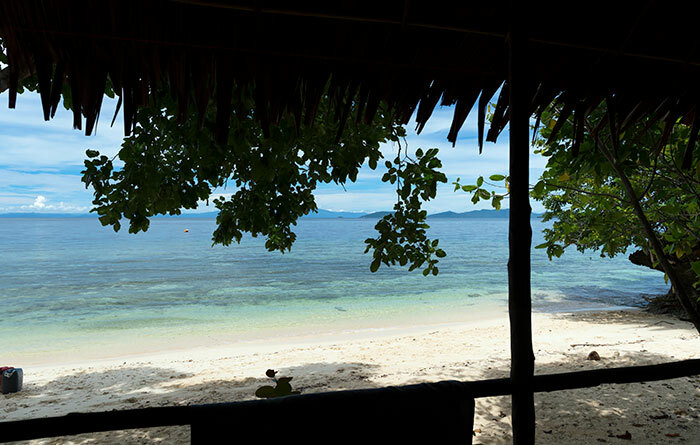 The Bungalows are very clean, the Food was one of the best i had in Raja Ampat (was in three Homestays). I dived in the dive station next to the homestay (10 minutes’ walk). The dive centre is a bit pricey, for example on the Island costs the dive 200’000-300’000 less, but the dive centre is very professional so the Price is okay. The People at the Homestays are very nice. Thank you again for sending my letters to Europe! They have some very sweet Dogs but they well behaved. The puppy was sooo sweet <3. I can really recommend this homestay if you want to dive or make some bird tours. Thank man for your feedback here. And I’ll sent your letters one by one in two weeks. Wonderful family, great food, spacious new dining area and a comfortable bungalow – perfect! I enjoyed my time at this secluded homestay with its easy access to Waisai. Fahmy, a teacher living there, was extremely helpful in providing information, organizing transportation and an expert in solving all Telkomsel problems. The reef heading west starts with an impressive expanse of table coral and evolves into a variety of beautiful coral all the way to the village jetty with its huge school of fish. I stayed 5 days at the Warimpurem Homestay and I felt very welcome. Mama Enggi is a really good cook and a lovely person, so is the rest of the family! Transport from Waisai Harbor to the Homestay was well prepared, even stops for small shopping has been made possible. The Bungalow I stayed in was very close to the beach, so not even a fan is needed in the room, ’cause it got good ventilation. Bungalow as well as toilet and mandi were both very clean! Towel, blanket, pillow – all provided and even changed after a few days! The family took me on a boattrip to another Homestay and to the market in Waisai. It was a very nice experience. And also Fahmy and Laura, both Javanese people living at the Homestay are very very helpful, nice and always in the mood for a nice chat. Even though Mama does speak little English (and me less than little Bahasa) we laughed both a lot about the stories of each other that were told with the hand of hands and feet :-) I would definitely recommend staying there! The pleasure is ours to have you here. 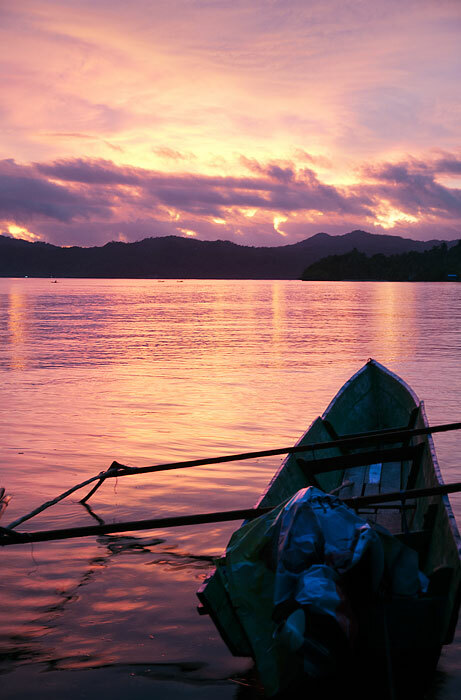 Enjoy your rest of holiday in Indonesia before back to your daily routines. I stayed in Waripurem nearly 2 weeks in February because it is the nearest homestay to the hospital in Waisai. I had an accident in Sorong and wanted to wait here until I was sure the wound would heal. The family was very friendly and did everything to make my stay enjoyable. The food was excellent. Every time something else always with various vegetables and fruits. Mama Engge is a really good cook. And at the meals I enjoyed the company of Fahmy when he was here. He was so helpful at any time. And I was happy to speak bahasa indonesia with him and I learned a lot. I could not swimm but spent a lot of time im my hammok. We’re really sorry about your injury and we did as best as we can do for make your stays and holiday in raja ampat are not disappointing you. We hope your wound have been recovered and it’s not affects in your daily routines. I spent 4 days with Mama and her wonderful family and could have stayed much longer. It was such a relaxing time and I was made to feel so welcome. Christine, Arnold, Piter, Jeremy and Fahmy – thank you all so much for making me feel so welcome. Christine and Mama are both amazing cooks, every meal was delicious. The local village of Saporkren is a 10 minute walk away along a wooden walkway – make sure you go there and see the kids playing and fishing on the jetties and go snorkelling at the small beach behind the cemetery. If you have time I recommend going on a day trip with Arnold. He will take you to some great snorkelling spots close by on a long boat- have lunch on a quiet beach, snorkel or beachcomb at your leisure- such a great value day in pricey RA. Homestay is clean and quiet, simply perfect. Do yourself a favour and don’t skip over this beautiful slice of paradise. Highly appreciate for your willingness to share with children in Saporken. Great family and good food, lovely beach for save swimming and fire on the beach. Enjoyed doing a spontaneous English class with the local children, if you go here it’s nice to bring some easy english books for the children. We stayed at Warimpurem Homestay for two days, one night as a convenient waypoint on our arrival into Raja Ampat and break the journey onwards to Manyaifun. We were warmly received and enjoyed the reef by the homestay, relaxing in the sea and an early morning birdwatching excursion into the valley near Saproken. The pickup was prompt, homestay is clean, tidy with the basics to get you started. It was great help having Fami, a helpful english tourism teacher who is now resident at the homestay and can help converse in english. On the birdwatching trip, our guides were Bruhm and Mel – two of the family members from the homestay. They don’t speak much english, so if you choose to do this trip, do speak slowly to them – they are bright and will carry a bird identification book to point out features. We got to experience a very short performance of the Wilson Bird of Paradise in the rainforest jungle along with calls from Butcher Bird, Mimic Bird, Red BoP* and saw a pair of Hornbills, White Crested Coacatoos, Imperial Pinon Pigeons, honeyeaters, parrots, green and purple winged parrots (absolutely stunning in flight) and many swifts, butterflies, kingfishers and other rainforest creatures. The food was lovely and the family, despite of having a family gathering for a funeral at a neighbouring village ensured that we had company and food till our pick up arrived in late afternoon. The homestay is clean, friendly and offers a fantastic entry point to your Raja Ampat experience. * Note – If you are going to want to see the Bird of Paradise, the Red BOP is spotted on treetops high up in the mountain on this island so the trips are different than that for the Wilson BOP – on other islands, you can mix the trip and spotting them in one trip is easier. We have been in Warimpurem Homestay during 4-5 days and I just can say positive things about it. From the first moment, we were “adopted” as members of this nice family. The food is absolutely delicious!! and all family members were paying attention to us in every moment, really interested about our needs. 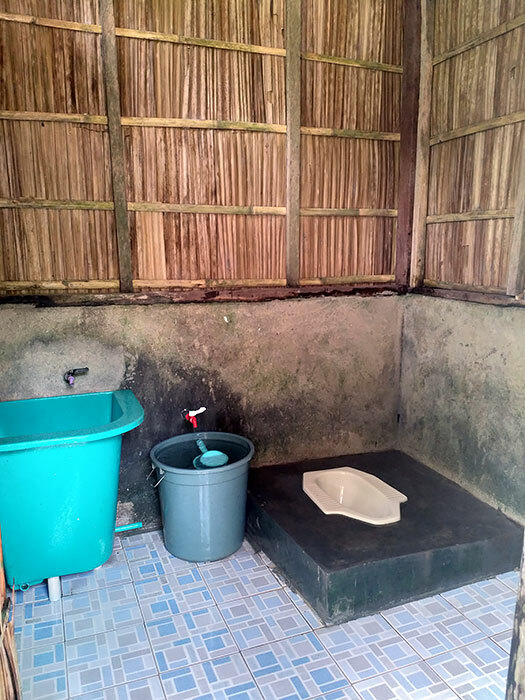 There are at least three meals everyday and cofee and tea available during all the day: fish, meat, vegetables, cakes… Bungalows are very nice and toilet and “dining room” are well prepared. Good snorkelling place around the homestay and also around the village. We also went to see the paradise birds, which is a very nice and enjoyable trip. The village is at 15 minuts walking, and it’s nice to visit it if youu are interested not just in diving and snorkelling. Very good experience!! I really recommend it!!! I was been here 01/05/16-05/05/16. At first must know that before You coming to Raja Ampat in the ferry station must paid Travel Permit (Surat Jalan), there is so crazy – 1 000 000 rupiah for 4 days only. I coming here only for birding. The homestay as very simple but clean, food its’ ok but every day the same meals – fishes, vegetables, banana. The family were warm and wonderful. But no one speak english there is a big problem! because I came especially from Sulawesi to see and take a photos two species of Birds of paradise and other birds. I was been were disappointing because there were doesn’t has a Bird Guide Benny Mambrassar, he was in Manokwari at these dates, But I wrote and had informed before several times. The owner offered me the cuisin of Benny, HE DON’T SPEAK ENGLISH. I had some problems, doesn’t seen Wilson BOP, very small species of the birds. I walking by own and seen more birds than we birding together. Be aware and be carefully! Accomodation were quite good as described but there were the ants inside the room. All members of family were very friendly including all pets – dogs and the cat also. And I don’t like that the small parrots has been tied with a line on the tree , he can’t fly away only feed and sit there is non- acceptable!!! The place is amazing, there has on the beach, the sea and views are incredible nice! My family and I have visited Mama at Warimpurem Homestay more than once and have always had a great time with amazing snorkeling and delicious food. The family are very kind and will cater to your every need. I would suggest walking to Sapokareng village along the boardwalk and checking out the fresh water springs that come out of the rocks. Also snorkel along the same route from mamas to Sapokareng, the plate coral and fish diversity are amazing. We stayed there for 4 nights in November for birdwatching. Unfortunately Mama Engge was only there for 1 day: food was delicious. On the other days food was still very good but not the best of Raja Ampat. It is a nice homestay with a relaxed feeling but if you more water-orientated other homestays offer better snorkeling. We were more than surprised by the exorbitant transport costs asked for a transfer from this homestay to Pulau Kri by slowboat. We politely declined and made arrangement though the homestay we stayed with on Pulau Kri. We had originally booked to stay at Yenkangkanes next door but the room we had booked was taken. This honestly had no guests so we took the bungalow on the beach. As usual the room was basic but the mattress and pillows were comfy. There is a lack of comfy places to sit and the addition of some hammocks would be ideal. Electricity is on for a very short amount of time, normally around 3 or 4 hours. We walked to the nearby village and watched the children learning to spearfish and the villagers going about the daily routines which was nice. The comments about the food are justified, Engge is a wonderful cool, by far the best food we had in R4. There were some issues however. We arranged with the homestay to do a tour to see the Birds of Paradise which didn’t turn out as expected. We asked to see both Wilson’s and Red but on the day out guides spoke no English. We saw the Wilson’s but on our way through the jungle (in the dark) our “guide” walked so quickly we often lost sight of him and didn’t know where we were going. We tried to ask about seeing the Red BoP but our attempts fell on deaf ears.. If you do stay here and want to see BoP I recommend booking with one of the guides recommended on this website. Other than that our stay was nice. Engelina and her family were so kind to us. It was like having a holiday family. The kids Peter and Jeremy were always up for having fun, it had a very warm, loving feeling at Warimpurem. Amazing food, fantastic views, 2 beaches, and great snorkelling. The dive resort next door ( raja amput dive resort) also had great dive trips, very well organised buisness. We went on a birds of paradise walk with Milky and Bram, up early at 4 am, saw both red bird of paradise and Wilson’s, great to be so immersed in nature. Bram was very helpful in translating and would often offer to go to the shop and pick up supplies ( cold beer :) We had a phrase book and had lots of fun communicating our thoughts and ideas with Engelina, she is a very patient teacher. We stayed with a friend 4 night at Warimpuren. Enggelina and her family were really nice and take good care of us. They were really friendly and Enggelina is always smiling. The food was really excellent and well served (yammy fried bananas). The bungalow is just near the beach and at night you ear waves and birds. They organised bird of paradise tour with good view of the birds. And Martin and specially Abraham spent some time with us chatting and walking to the village (Abraham speak really good english). Snorkeling at Saporkren is really good, but you need to bring your own gear. A really good place to be. I stayed at Warimpurem Homestay for 5 nights in May 2014. I was blown away by its secluded beauty, simple lifestyle, warm family, and excellent sea food. Even though I was a female solo traveler first time in Raja Ampat with not much planning in advance, I was able to enjoy myself to the fullest especially because the family took care of me very well and helped me make arrangement for my activities every day. I think Waiego is the most accessible island in Raja Ampat, if you have limited time and budget, and Warimpurem Homestay can be a good base for those who plan on doing island hopping, snorkeling/diving, as well as exploring the interior jungle of the island. One of the highlights of my adventurous day (other than delicious dinner, of course) was to bath in the spring water overlooking the calm ocean in front of the homestay. I really hope to go back there soon again. hay saya baru membaca komentar sodara rumi. sepertinya tempat ini termasuk salah satu tmpat recomended. tetapi di keterangan blog d tulis d homestay tidak menyediakan alat kebutuhan snorkling. bagi kami yang tdk memiliki alat snorkling bagaimana? terus untuk soal spot diving apakan homestay Warimpurem juga memberikan suguhan pantai yang sama indahnya dengan pantai2 yg lainnya ? Gorgeous location, very scenic. We didn’t stay here but had lunch twice at this Homestay. They served fantastic food, very tasty and I am very grateful that they arranged it without much prior notice. Saporken Village is so scenic, it is definitely worth a visit. Stayed there 3 nights in October 2013 , beautiful location , extremely friendly family and excellent sea food , heavenly . ( neighbor Ben can take you to see the Paradise birds “cendrawassi”).